After years of outright climate change denial, President-elect Donald Trump has somewhat softened his tone since the election—but not his actions. Many see his high-profile meetings with climate champions like Leonardo DiCaprio and Al Gore as mere diversions from the scorched-earth agenda clearly playing out with his Cabinet picks. So when Trump says things like "nobody really knows" if climate change is real, as he did recently on Fox News, it’s an insult not only to the thousands of scientists who do know, but also the intelligence of the American people. Maybe someday he’ll acknowledge that people should do something about it. Priebus, former chairman of the Republican National Committee, has tactfully swallowed Trump’s unpalatable positions for over a year—that’s probably what got him the chief of staff position. When it comes to Trump’s climate denial, he recently said that Trump’s “default position” is that it’s a “bunch of bunk.” But fear not, he reiterated that the president-elect will have an open mind about that bunk. Pruitt’s main challenge will be finding ways to sue the EPA, one of his favorite pastimes as Oklahoma's attorney general, while he’s also in charge of it. Rex Tillerson is not an outright climate change denier. What a shock, right? This may be in part due to his tenure as head of multinational energy company ExxonMobil, where he had to interact with an international community in which being a climate change denier makes one a pariah. Nonetheless, he’s spent his career fueling America’s addiction to oil, and as secretary of state he’d be able to help the industry extract that dirty stuff in a host of new ways. Rick Perry probably didn’t think he’d be dancing with the Republican stars again so soon after his failed presidential run. But his firm anti-climate position and avowed desire to get rid of the Energy Department made him an irresistible candidate for Trump’s cabinet full of trolls that actually don’t support the departments they’ll be leading. Sessions’ climate denial is probably not at the top of the list of his of undesirable qualities, but it’s notable for its alarming inaccuracy. In 2015, Sessions tried to argue that the fight against climate change is a conspiracy to afflict poor people. Sessions is just one of the many Trump cabinet selections to receive substantial sums of money from the fossil fuel industry. 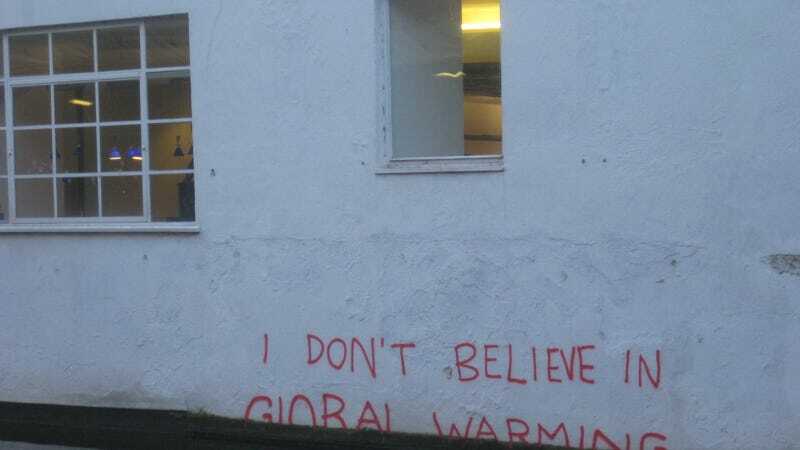 He also said that those focused on climate change are “welcome to believe whatever they want to believe,” which is not usually part of the scientific process. For someone tapped to head the C.I.A., it’s unfortunate that Pompeo seems to consider climate change only through a political prism—a stance he long nurtured as a Kansas congressman. As a member of the House Energy and Commerce Committee, Pompeo enjoyed lambasting environmental activists and green energy companies as part of some Obama-led conspiracy to raise energy prices. McMorris Rodgers is a U.S. Representative for Washington state, so you would think she’d be a strong advocate of climate action. But you’d be wrong. McMorris Rodgers has actually explicitly voted against letting the interior secretary consider climate change when setting policy. As head of all U.S. public lands she would fight to open up more oil and gas drilling as well as make it harder for the president to protect public lands through things like national monuments. Not that Trump would want to do that, unless of course the monument was in his name.